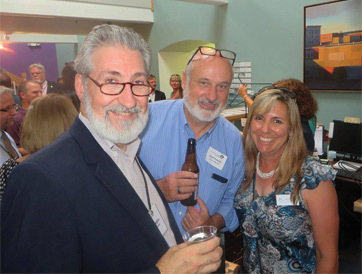 Concord, NH (June 2017) – The Greater Concord Chamber of Commerce celebrated the recipients of the Chamber’s 2017 Pinnacle Awards on June 1st, including two awards that were top secret until the event. The Chamber’s annual Pinnacle Awards recognize businesses and individuals who have demonstrated professional excellence and commitment to the Chamber and the community. The Pinnacle Awards are generously sponsored by Eversource, Eastern Bank, Sanel Auto Parts Company, Business NH Magazine and Courtyard by Marriott/Grappone Conference Center. 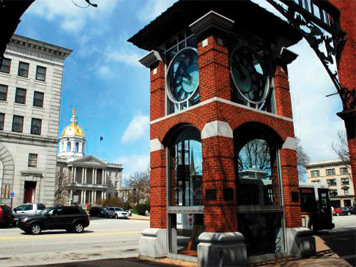 Congratulations to the 2017 recipients: Arnie’s Place, Small Business of the Year; Merrimack County Savings Bank, Business of the Year; James P. Bouley (Mayor City of Concord), Business Leader of the Year; and White Birch Center, Non-Profit Business of the Year; and Severino Trucking Company, Inc., Outstanding Performance. “We enjoy an abundance of civic engagement in the Capital Region. You can never thank people enough for the extraordinary efforts they make to build a first-class community like ours,” said Greater Concord Chamber of Commerce President Tim Sink. The awards luncheon also included the surprise announcement of the 2017 W. Grant McIntosh Volunteer of the Year Award, given to Patricia Vaillancourt, and Concord’s Young Professional of the Year, presented to Matt Walsh, City of Concord. Also recognized was the Leadership Greater Concord Class of 2017, a group of 23 emerging community leaders who took part in the Chamber’s year-long civics program. For more information, please contact the Greater Concord Chamber of Commerce at (603) 224-2508.